Défi sportif AlterGo launched its advertising campaign today with the unveiling of the poster for its 36th edition, which will take place from April 26 to May 5, 2019. The unveiling of this poster is the first step in a 360-degree campaign that will include a web component, a poster campaign and television advertising that will be broadcast on the airwaves of its media partners. The poster will also be published in several formats on the web and on Défi sportif AlterGo’s social networks. The two athletes who were selected for this campaign symbolize the impact that Défi sportif AlterGo can have on those who take part in it. One is an elite athlete who inspires self-improvement through her accomplishments and the other is an up-and-coming athlete who is well on his way to reaching his full potential. The campaign highlights athletes and their pride. They represent all Défi sportif AlterGo participants and remind us that it is they who make the event such a celebration of human potential. “Défi sportif AlterGo is a unique event throughout the world as it is the only one that has been bringing together elite and up-and-coming athletes with every kind of functional limitation for 36 years. Athletes come from over 20 countries, across Canada and all regions of Quebec. Although it is an international event, it is important for us to promote local athletes,” said AlterGo’s President and CEO Maxime Gagnon. 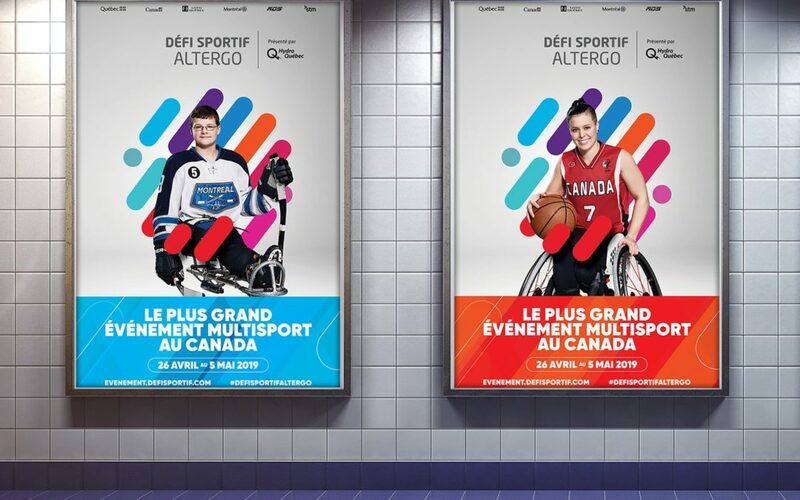 The athletes featured on this poster are Cindy Ouellet, a member of the Canadian National Wheelchair Basketball Team, and Mathieu Lelièvre, a young parahockey player. Ouellet first participated in Défi sportif AlterGo in 2005 in a national swimming competition. She then rose through the ranks to join the Canadian National Wheelchair Basketball Team in 2007, which led to her first Paralympic Games the following year. At 30 years of age, she has become a perfect role model for the younger generation. Mathieu Lelièvre is a rising star in Canadian parahockey. Only a few months after undergoing chemotherapy treatments and the amputation of his left leg, Lelièvre took to the ice and scored his first goal. A promising athlete, he aspires to play at the provincial level.